If you're looking for a long-lasting, attractive, and comfortable basement flooring product, Basement Systems Edmonton of Alberta has just what you need. 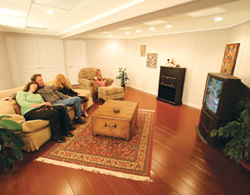 They offer six different basement floor tile options, with something to suit every taste. 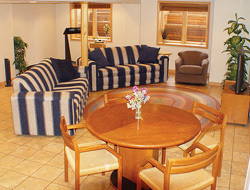 Basement Systems Edmonton can provide basement flooring in carpeted, tiled, wood, and parquet wood tile floor designs. These unique basement floor designs will never rot, grow mold, or be damaged by humidity like wood, carpet, and other organic materials, as humidity rises from the concrete basement floor. And if you're interested in installing custom basement flooring of your choosing, they can also design a basement sub floor that will serve as a vapor barrier while also making the floor warmer and more comfortable. None of the floorings need grout or adhesives to install, meaning that they can be used right away after installation. And because they do not adhere to the floor, they can be removed and replaced easily, should it ever be needed. All ThermalDry® floorings are designed with an airspace underneath that creates a thermal break between the tiles and the cold concrete below. Your floor's surface will be 8-10 degrees warmer, making for a more comfortable, temperate surface underfoot. 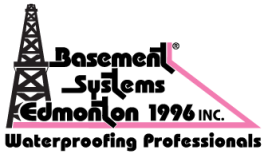 All of Basement Systems Edmonton's basement floor products come with a written warranty and come with a FREE, no-obligation basement floor finishing estimate, available to homeowners in Rosevear, St. Paul, Vermillion, Wainwright, and all areas nearby. Contact them today to get started! Unlike traditional carpetings, ThermalDry® installs with snap-in carpeted tiles that can be easily removed and replaced. This means that if a section of your carpet is worn in a high-traffic area, such as the end of a staircase, you're not committed to an unbroken sheet of carpeting on your floor. Simply remove the worn or damaged tile and replace it with a new one in a matter of minutes! 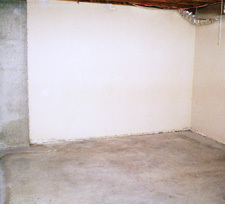 Call us today for a free quote on finishing with basement carpeting! ThermalDry® Basement Floor Tiles: Discover the beauty, comfort, and lasting value of ThermalDry® basement floor tiles in your home by meeting with a representative from Basement Systems Edmonton today. They provide finished floor tiles that include all the beauty of a ceramic tiled floor in your basement without its many disadvantages. ThermalDry® tiles come in two beautiful designs: Sandstone and Canyon Beige, available throughout Alberta. ThermalDry® floor tiles are now also available in a sleek, new Parquet Wood Tile design, for those who'd like a modern look to their finishing design. When ceramic, stone, or marble stone tiles are grouted to a basement floor, not only are they difficult and expensive to remove, but they're hard, cold, and have grout lines that can grow mildew and harbor bacteria. ThermalDry® floor tiles are designed with a waterproof design that's flexible and more forgiving of falls, uses no grout, and will never shatter like hard stone or ceramic floor tiles. 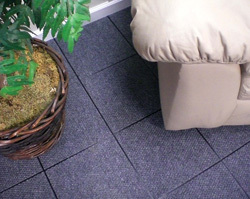 For a FREE basement floor tile quote, contact us by e-mail or phone today! MillCreek Laminate Wood Flooring: Enjoy the timeless warmth and comforting appeal of a natural wood flooring with MillCreek's wood-design laminate flooring. Designed and warrantied with 100% waterproof materials, it's able to survive humidity, moisture, and even a basement flood with no damage. Unlike real wood flooring, MillCreek Basement Flooring will never rot, support mold growth, or expand and buckle with absorbed moisture when wet. It can be cleaned easily with a mop, and at 1/2" thick, it uses far less of your precious basement head room than a traditional wood basement floor. Available in Natural Oak and Red Mahogany designs, it's made to match any ambiance. ThermalDry® Basement Floor Matting: Customize your basement floor with the carpet of your choice, while never worrying about humidity damaging the material from below with ThermalDry® Floor Matting. With its award-winning design, your carpet is protected by a complete vapor barrier on your floor, while your finished floor is warmer, healthier, and more comfortable than ever! ThermalDry® Basement Floor Matting should double the life of your custom carpeting, and the plastic tiles can outlast several generations of carpet. If you live near Bonnyville, Cold Lake, Conklin, Edgerton, or in nearby towns in Alberta and would like a FREE basement sub floor quote, call or e-mail Basement Systems Edmonton today!